It is not required to make a ball every time you’re shooting to win the game. It is required that you control the table. You have to have a balanced pool game. That means you decide to shoot an offensive or defensive shot based on what controls the table. Most players shoot a defensive shot because they don’t see a ball they can make. That kind of thinking has to change if you’re ever going to become a high skill level player. Trying to bank or kick this ball in is a very bad idea and would likely sell out the game. 1. The game is 9-Ball. This safety can be used in other games. 2. The 9 ball is not frozen on rail. 3. There is no easy shot for pocketing the 9 ball. A. Play a legal safe without leaving a simple shot. B. Medium stroke the cue ball at an angle into the 9 ball. C. Leave the A ball frozen on the bottom rail. Drill No. 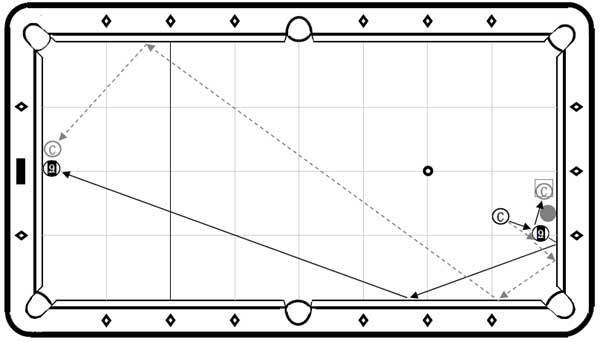 1: Sending the 9 Ball to the opposite side of the table and leaving the cue ball on the bottom rail. Drill No. 2: Sending the Cue Ball to the opposite side of the table and leaving the 9 ball on the bottom rail. Work on each drill until you have successfully caused your traveling ball to land within 4 inches of the top rail and inside of one diamond from the center of the table diamond. Pro Skill Drills Volume 5 has 55 Safety Drills to take you to this level of play.